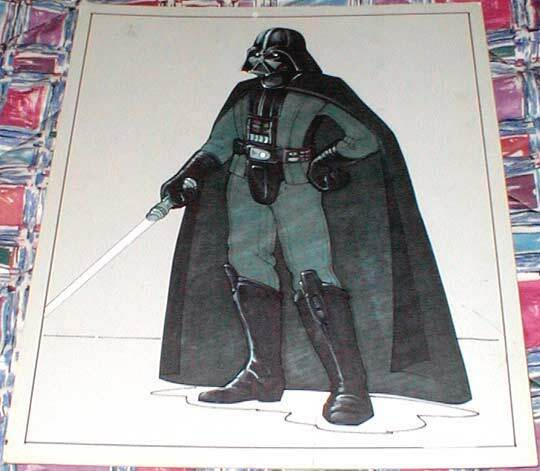 This full color illustration is probably the earliest known piece of material relating to the development of Kenner's large size Darth Vader action figure. It's rendered in what appears to be a combination of ink markers and water colors. This work was done on a separate piece of paper, cut out and then pasted to the piece of sturdy illustration board on which you currently see it. As you've probably noticed, the image doesn't exactly resemble the toy as it was eventually produced; it's more of a character sketch than a representation of the actual figure. This is probably because the piece was used only to represent the 12" figure concept in very rough terms, at a time well before the figures entered three dimensional development. However, you'll notice that the scale of the image closely corresponds to that of the Vader figure, it being a little over 12" in height. Additionally--and in my opinion most intriguingly--Vader's arm is here represented as being extended out from his body, with the wrist bent slightly and the saber grasped firmly in the hand. Those of you familiar with the Vader 12" figure will recognize that this is almost exactly the way in which the left arm of the toy was eventually designed. It's pretty cool to see that detail present in such an early piece of conceptual artwork. This illustration and it's companions (three others are featured on the Archive) are some of the largest and most detailed pieces of conceptual art to have surfaced from this early in the development of the Star Wars line. And it's fanastic to be able to see them, as they allow us to peek into the early development of these familiar toys.